Jewelry displays are the most important presentation a retailer can create. The finest gems and jewels should be presented in an elegant display to complement the beauty that lies inside the case. 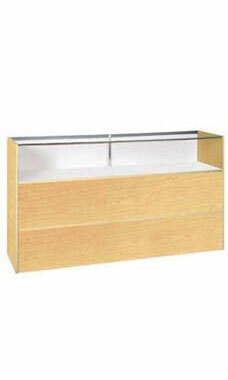 That's why our Jewelry Display Case with Maple finish is a must-have for retailers. The modern classic will provide you with dependability and elegance for years to come. Featuring a low pressure melamine laminate finish with a tempered glass top, front and sides, the jewelry display provides customers with a full vision into the case, so they can view their jewels in detail. With rear white sliding doors and a concealed rear storage, jewelers can easily take jewelry out to show customers. Crating for secure shipping is included in the price of the case. Overall measurements include: 38"H x 18"D x 70"L. Glass display area is 12"H. Optional lock and light kits sold separately. Fully assembled and ready to ship.